…and now I’ve done all 4. Let me start at the beginning. I’m unloading my snowboard in the Thredbo car park, but today will be like no other because you see, not only do I not have a lift ticket at Thredbo today, but I’m not even on a regular snowboard. 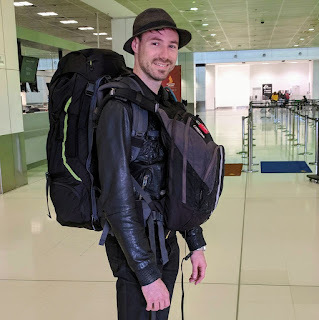 Today I’ll be taking my first of 3 backcountry tours which are being run by Thredbo for the first time this year, and I’ll be doing it on a hired Jones splitboard from the great guys at ESS Boardstore Jindabyne (shout out to Adrian for the stellar ride!). For those of you who haven’t done a lot of backcountry skiing before (aka me before today) it involves taking a chairlift up to the top of the ski resort area, then hiking up the mountain further, while on skis. This requires a specialised set of “touring” skis with bindings which allow the toe to pivot and your heel to lift. It also requires that “skins” are attached to the bottom of the skis which allow you to glide in one direction but grip in the other direction. The combination of these 2 features allows you to walk straight up a hill without duck-footing or side stepping like you might do for short climbs within the resort area. But “You’re a snowboarder!” I hear you cry, how could this process possibly apply to me? That is where the splitboard comes in. 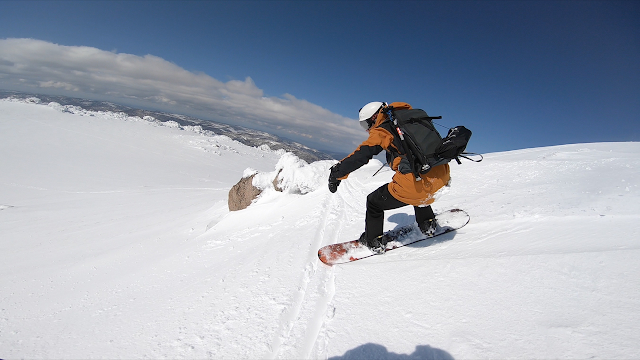 A splitboard is basically a snowboard, cut down the middle and clipped back together. The bindings are removable and allow attachment to the board in either ski or snowboard configuration. Add the same skins I mentioned before for grip and BOOM- backcountry snowboarding. So after a brief lesson on avalanche safety and rescue, we head up the Kosciuszko chairlift and Basin T-Bar to our start point. Today we only travel a short distance, enough to dig a pit and examine the layers of snow. This helps us understand the conditions, and know if it is safe to snowboard down. We climb to the summit of Signature Hill, enjoying the spectacular views along the way, then make fresh tracks on our way back down to the resort area. This trip is only a small taster, designed to teach you skills to use on the full day trips, but riding Signature Hill was a lot of fun and I can’t wait for what the next 2 days have in store! 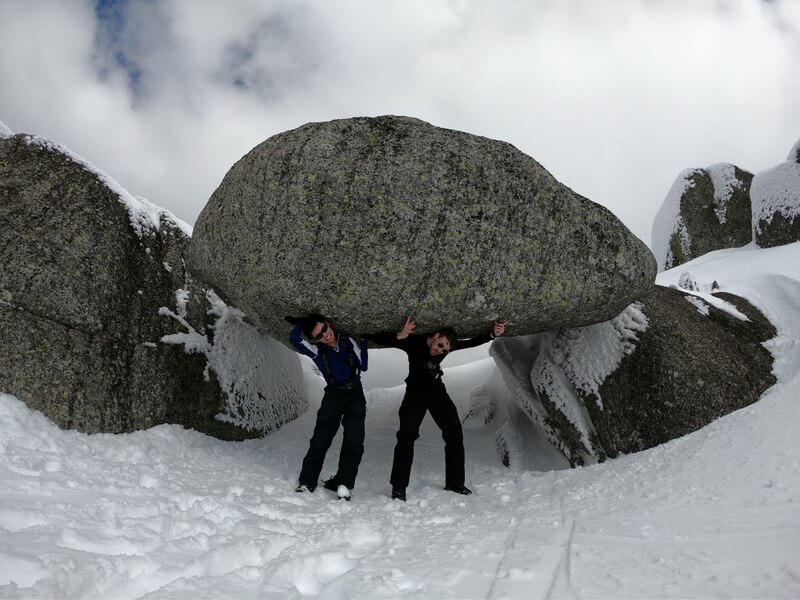 We set off from Thredbo Valley Terminal at 8:30am with Jennie, the same fantastic guide from Signature Hill, and zig-zag from the Kosciuszko chair up Basin and Karel’s T-bars to Australia’s highest lifted point at 2094m. This is where we start our ascent. We head out the back of Karel’s along a flat plain for a few hundred metres while I get my bearings on what it feels like to be a skier. Look, it’s basically walking, but it’s still an odd feeling. I’m used to going down everything sideways and now I’m on snow but looking straight ahead. I get the hang of it pretty quickly but the hardest thing is not looking at my feet. I am a total noob at this after all. We climb the first hill and start to get glimpses of the peaks around us. All 10 of Australia’s highest mountains are within a fairly close distance of each other, but we can’t see Kozzie yet- it’s hidden behind another mountain. Over the next hill we see Rams Head, Australia’s 4th highest peak, and the first one we are summiting today. The snow out here is beautiful and we can’t help but stop and take some photos around a rather large rock. As you can see below, the snow here is DEEP. 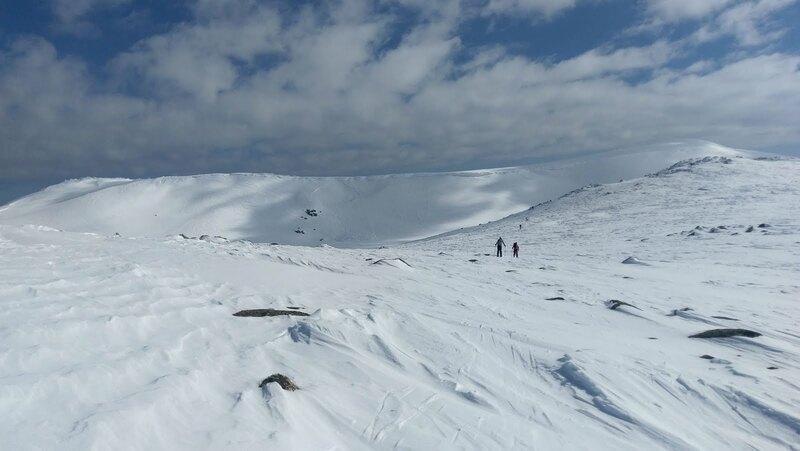 We scope out our run down Rams Head from the bottom and pick our “skinning” path up the side. The top of this peak is 2190m and the view is spectacular in every direction. 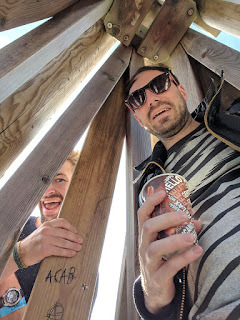 It is so good that I take a photo in every direction just because they are all great, only to discover that Google Photos automatically joins panoramas for you… So you can thank good-guy-google for the below accidental panorama! So I remove the skins from my “skis” and put the splitboard back into snowboard mode. 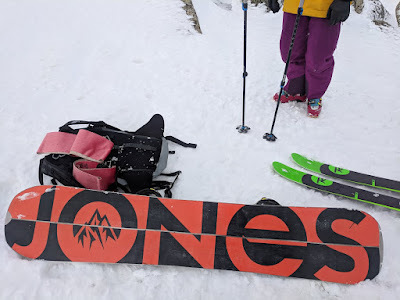 (cue music: Transformers, Snowboard in Disguise) The run down from Rams Head was without a doubt the best ride of my life, on a snowboard or off… We descend 300 vertical metres down the valley with wide open space and unlimited line choice. The turns are smooth and the angle of the initial slope, epic, and the snow! Well the snow is perfect. Riding the beautiful top layer of 40-50cm of powder is incredible and it is like there is no delay between where you want to point the board and where it goes. I was one with the snowboard, the mountain, and the snow. It was at this point I appreciate that despite my expectations of a splitboard being mediocre skis and a mediocre snowboard, the Jones splitboard was actually a fantastic snowboard in its own right. If I were to own this board, I would consider bringing it to resort areas as well rather than carry 2 boards. This was a very pleasant surprise, and not at all what I expected! After transitioning back to ski mode, we summit the next peak, sometimes called Middle/Central Rams Head but known to the locals as Ultraworld. We take off our skis and clamber over some rocks, you can see why. The view is spectacular, particularly on a day like today with no wind and bright blue skies. We take the obligatory photo under the rock which we are clearly legitimately* holding up, and transition to snowboard mode. The run down from Ultraworld absolutely rivals the previous run from Rams Head proper, but it stays steeper for longer. Being steeper it is a shorter run, but I’ve found my feet now (and I trust this board) so I skip the hesitation and point it straight down the hill. The snow is fantastic as above and I’m carving the shallow S-turns with ease. I rocket down a dip to make it up the other side and am nearly undone by a raised bar of snow which I couldn’t see from the top, but thankfully I stay up and avoid the embarrassment of having to walk. Rosie, one of my tour mates, was not as fortunate. We reach the tree line, where we started the ascent to Ultraworld, and continue to snowboard down through the trees. I love tree runs, particularly like this one where all 4 of us get to make our own fresh tracks and the snow is not icy or crusty at all! We reach the Bogong Creek and follow the snow bridge crossing carefully chosen and tested by our guide, then it’s time for the last ascent. It was at this point that my other tour mate Alan says to me “I’m glad you convinced me to do this”, clearly he is enjoying this as much as I am, but it’s not over yet! The last ascent takes us up Saturday Hill to the Dead Horse Gap trail. It’s at this point that I realise there is one more great thing I get to do today, and that is make one of my mates who is not on the trip insanely jealous! 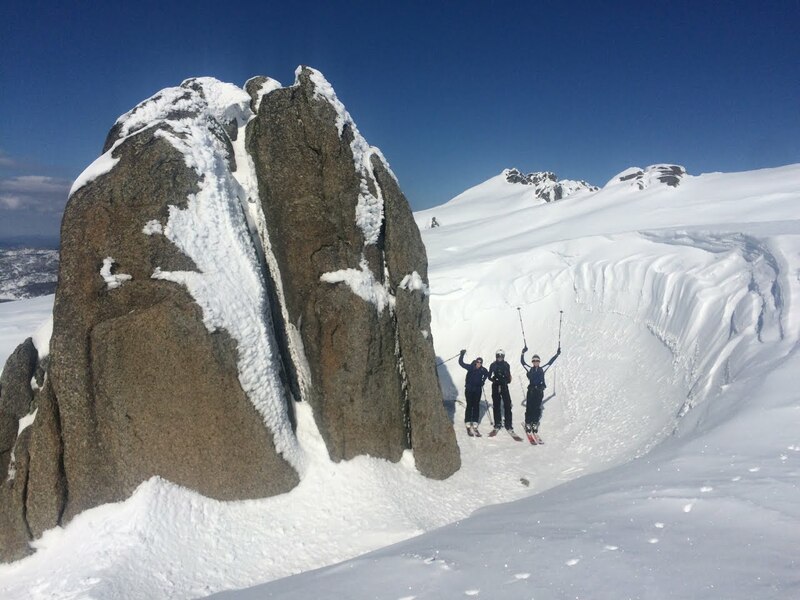 Our last run of the day will take us back to Thredbo through the Golf Course Bowl, Benj’s favourite ski run- and what’s more, we will be starting from a rocky outpost at the top of the bowl, above the normal entry point, which you can't reach from the T-bar! After being spoilt with fresh tracks all day the Golf Course Bowl feels a bit too mainstream… but it’s still a great run, and to make things better I keep my speed nicely through the last gully and ride the exit trail out without unclipping. At this point I would happily have called the day an epic success, but one last surprise waits around the last corner. The Golf Course Bowl exit trail hits Funnel Web, which is the usual way back to the Supertrail and the way home to Valley Terminal, however our guide points out that there is actually a new run, only opened this season, called “1770” which can take us home. The top of this run is a stack of moguls… needless to say that a tired Alan is not impressed. But the remainder had some fun bits to it, including a nice drop in to a bridge across the creek and a meandering path through the trees to exit back at the Supertrail. The only catch was the end which was a little flat, but with a little skier-assist I made it. Cheers to Jennie for the poles and Rosie for the nudge! We arrive back at Valley Terminal having travelled 10.8km and climbed 553m under entirely our own steam. I know I’ve only just started, but I’m already in love with backcountry snowboarding. We stop at the Wild Brumby Schnapps distillery on the way home to celebrate the day’s adventure. I turn to Alan and the first thing I say is… “So I’m thinking of buying a splitboard”. So after the epic success of my first full day snowboarding backcountry, I guess you’re wondering how I could possibly top that!? Well I do. 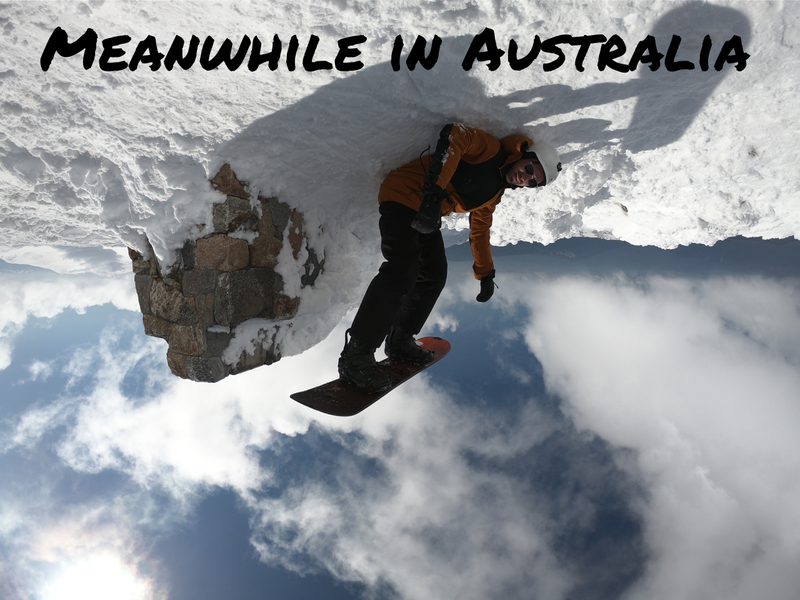 Today’s backcountry tour will take us to the top of Australia, Mount Kosciuszko. Now this is a peak I have summited often in summer, after all there is a walking track which goes only a few km from a carpark… I think most people’s Grandmas could do that walk! But I have only ever counted this peak as half-done. 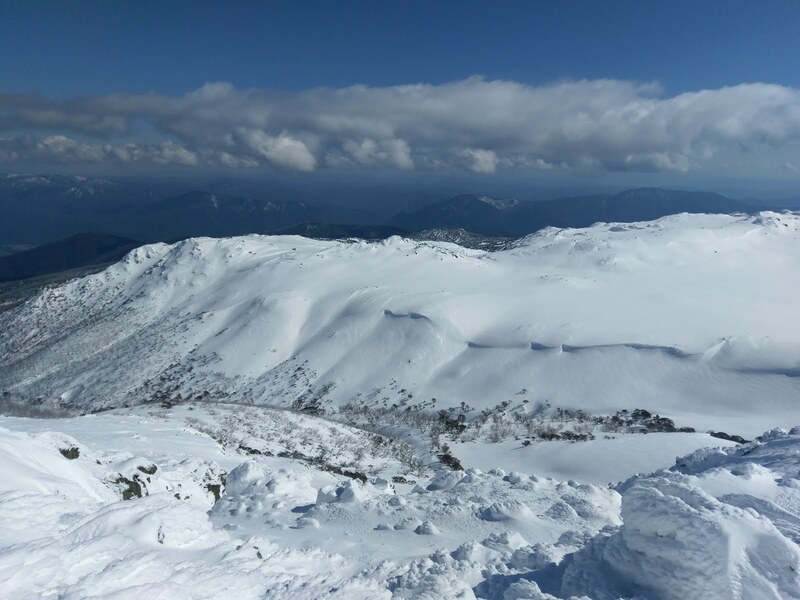 To complete the summit of a mountain like Kosciuszko, one must do it while snow covered in the winter months- and that is precisely what I’ll be doing today. 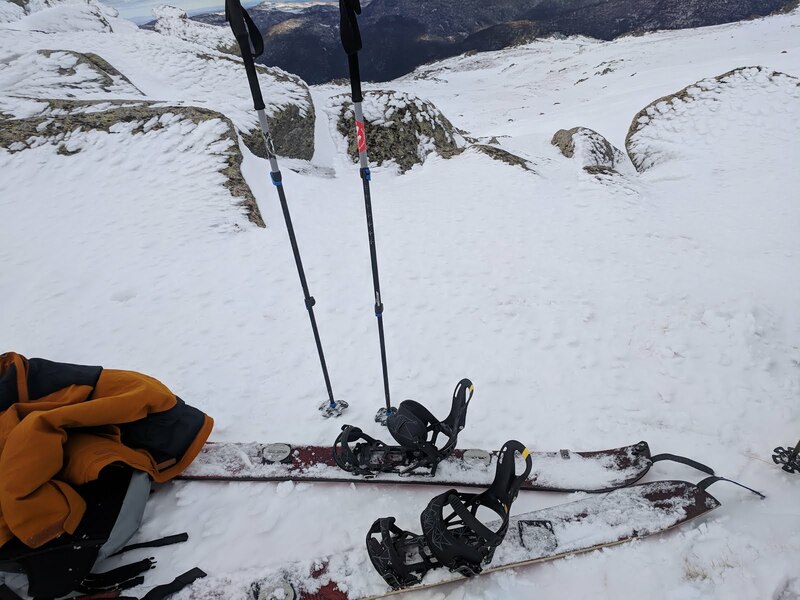 We start at the top of the Kosciuszko chairlift (no surprises there) where I once again put my splitboard in ski mode with skins for grip. We have a long, but relatively flat hike ahead of us, about 5km, to the base of Kozzie. However along the way we are distracted by something worth a short detour, the remains from an avalanche which occurred about 4 days ago. 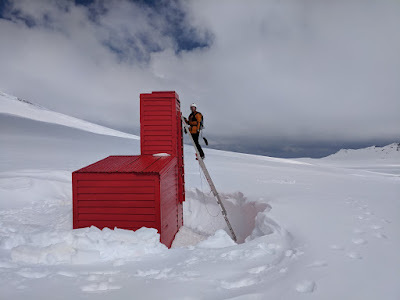 Prior to my backcountry experience this week, I would have told you that no serious avalanches happen in Australia, but boy was I wrong. 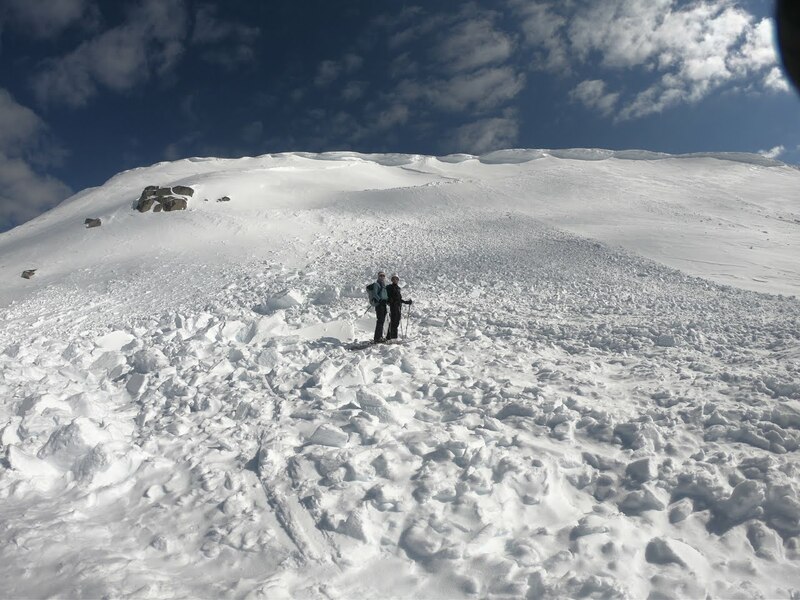 It is only when you approach the debris field at the base of the Kosciuszko cornice that you get a true feeling for the size and magnitude of this avalanche. The block of snow which you can see next to us is approximately 2m long x 1m wide x 1m deep. Despite falling 80m from the cornice, it is still in one piece- this is not soft snow. A block like this would definitely break your leg, and could easily crush you. Got it, avalanches are no joke. We reach the base of Kosciuszko and start the slightly steeper ascent to the top. As we do we are blessed with clear blue skies and only a light to medium wind. This may not sound like much, but to be here at the top of Australia, snow covered in the middle of winter is a huge personal goal of mine completed… almost. This goal will be complete once I don my snowboard and take the highest ride on the continent down from here! We take a few photos and I strap in for one hell of a ride. The line we have chosen to take down, carefully scoped out during our ascent, is to the south. There are a number of good reasons for this, firstly because we get to ride the Kosciuszko ridge line while enjoying the breathtaking views from literally the top of the world*, secondly because we get to pass the Kosciuszko cornice, without getting too close of course, and finally because South Kosciuszko has a steeper line than Kosciuszko proper, which would have been exactly the same boring line we hiked up! So with a little more walking, we get to the the South Kosciuszko face which we have picked as our line but as is the unpredictability of alpine regions, the weather changes and we are in a white-out. Being the snowboarder I have stopped to clip in and the 2 skiers have maintained their momentum along the traverse. I can no longer see them but I know which direction they were going. I attempt to follow, but even with my low-light goggles on I only make it a few metres before I realise I can’t see the snow in front of me enough to know if I’m going down or up the slope. I have no choice but to stop again and unclip. Without being able to see the slope I could easily pick up speed without realising it and end up in a very dangerous situation…fast. I yell out to the others and can make out 2 spots of colour in the distance where they have stopped, but only just. Thankfully while walking I can follow their tracks in the snow and get back to them, but we’re not out of the woods* yet. We are now on South Kosciuszko, at the top of the steepest line we could pick, with zero visibility. We make the plan to stay close and meticulously follow Jen’s line down the face keeping slow and gentle turns, no hero runs this time. Thankfully just as we start to drop in we get below the cloud level and can see clearly again. Jen takes off and leads an epic line off the top of Australia and I couldn’t be happier. It was an important lesson to learn that even a blue-bird day can turn nasty at any moment, and at that point I would have been thankful just to make it down alive. However even after the change in weather I still got the chance to conquer Mount Kosciuszko, riding an epic line, successfully snowboarding off the top of Australia. Goal complete. Now this is where the blog is supposed to end, but there was one more surprise the mountain had in store for me today. I had previously mentioned to Jen that I have been to many of the huts in Kosciuszko National Park during the summer, but one which had always eluded me was Cootapatamba hut, a bright red emergency shelter conveniently located down from South Kosciuszko. Today’s exit from Kozzie takes us via Cootapatamba Hut, ticking off another achievement from my list, and leaving me with another priceless photo of this beautiful part of the high country. Keep enough speed across the final flat plain that I don’t have to unclip until I’m back at Valley Terminal! After 3 days in the backcountry, 31km travelled and 1300m climbed without chairlifts, I can tick “Snowboard down Mount Kosciuszko” off my bucket list. Summit 1 complete, 6 to go.